I’m a TV producer looking for people to take part in a pilot about DNA testing. It doesn't involve actually appearing on television as it’s in the early stages of development. 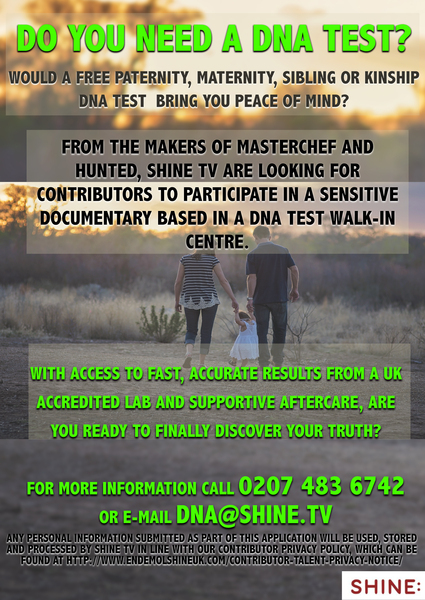 We are working with a DNA testing clinic to create a sensitive new documentary. We are looking for people who want a sibling, kinship, paternity or maternity test. There are many reasons why people get DNA tests done. Perhaps you want to put a family rumour to bed, or maybe you just want peace of mind that you are biologically related to someone. We are covering all costs and expenses of the testing. We are also offering aftercare for people who take part. If you want to find out more then please email [email protected] or call 0207 483 6742 and the team will be happy to answer any questions.